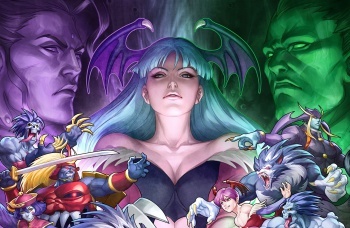 Darkstalkers Resurrection was among the top ten PlayStation Network best-sellers last month but it's still a failure in the eyes of Capcom. Released in mid-March, the 2D fighting game Darkstalkers Resurrection managed to muscle its way to seventh place on the PSN Top Sellers list, just behind BioShock Infinite and ahead of Yu-Gi-Oh! 5D's Decade Duels Plus and Black Ops 2. That seems like a pretty respectable showing to me, especially since it only had about half the month to work with, but to Capcom it's apparently a letdown. "Sadly, it's not as high on that list as it really needs to be to be successful. We're working on promotions and the like to improve the situation. We've not given up," Capcom Senior Vice President Christian Svensson said in a message posted in the "Ask Capcom" forum. "But I'm disappointed in the opening sales response relative to any other fighting title we've put out on the same platforms given the frequency and urgency of requests we've had here over the last several years and the quality of the execution." The problem, it seems, is not with the game, which has received solid reviews, but simply that Capcom expected too much from it because of all that "frequency and urgency of requests" business. "I'm not blaming fans who did buy it and supported the brand. I'm very thankful for those guys (thank you, to all of you)," Svensson wrote. "I'm more disappointed by my misread of the information in this particular case." Svennson said last week that Capcom had "probably run the course" with updates of games like Darkstalkers, adding, "It seems the novelty of such projects is wearing off even within just the fighting game community based upon the sales data of our last two launches." And so it is that a top-ten-selling game, on the basis of less than a full month of sales, can be considered a failure and perhaps even herald the end of a franchise. What strange business this is.